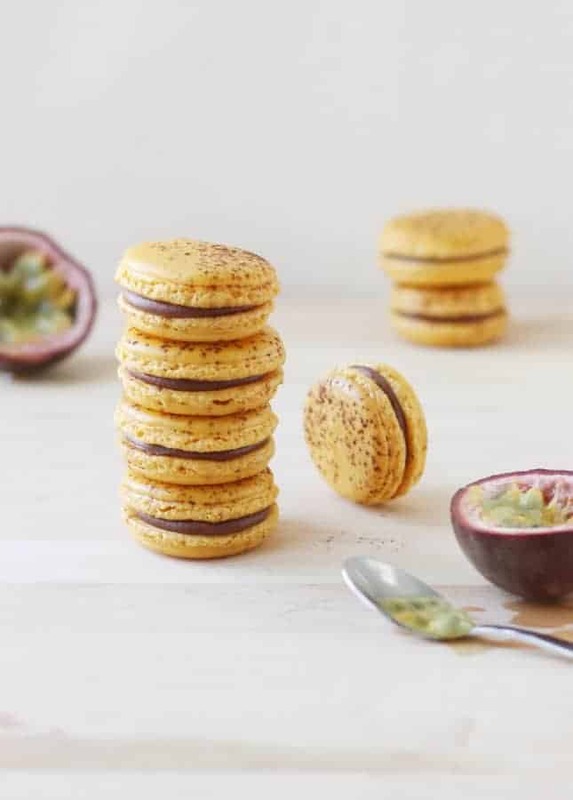 This recipe is an attempt to recreate my favorite macaron in the whole wide world: Pierre Hermé’s Mogador, in which a milk chocolate ganache is delightfully infused with exotic passion fruit. It’s one of Hermé’s grands classiques, which include his most straightforward but most popular macarons. My version is almost as transporting as Hermé’s; in fact, the only thing that would make biting into this macaron better is enjoying it in a street of Paris. 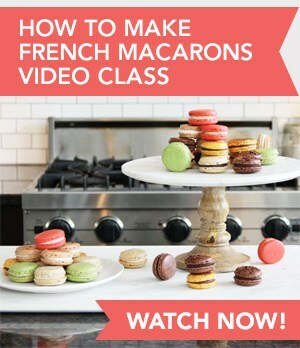 I’m sharing this recipe to celebrate the launch of my brand new online video class: How to Make French Macarons. 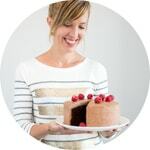 I designed my video class both for novice bakers who want to learn new skills, and for experienced bakers who are seeking to master a new and impressive dessert. The class is divided into 15 short videos that will show you the essential equipment you need, the important steps to follow, the techniques to master, and the potential pitfalls to avoid. 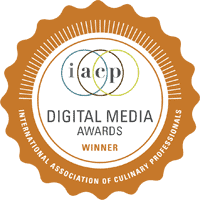 You can watch the videos on your own time, start practicing, share with other budding macaron makers, and ask me questions if you encounter difficulties along the way. Watch it now! Makes Makes about 56 shells, or 28 assembled macarons. Want to recreate Pierre Hermé’s Mogador macarons? These delightful Milk Chocolate Passion Fruit Macarons are as close to the classic as you can get. Return the egg whites to room temperature at least an hour before making the macarons. Make the milk chocolate and passion fruit ganache: Cut the passion fruits in half, and scoop the seeds into a fine mesh strainer set over a measuring cup. Using the back of a spoon, press, scrape, and press the seeds again against the strainer to extract the maximum juice you can. You should get about 1 tbsp [15 ml] juice per passion fruit. Make the macarons: In the bowl of a food processor, add the powdered sugar and almond flour, and process until the mixture is thoroughly incorporated, 30 seconds to a minute. Sift mixture to make sure no lumps or bigger bits of almonds are left. Whisk the egg whites on medium/high speed for a minute or two, add a tablespoon of the granulated sugar, continue beating and add the remaining sugar slowly. Beat until the egg whites are stiff, dense and creamy. Mix in three drops of yellow and one drop of orange gel food coloring. The macarons should be of a bright warm yellow color. Add more color if you think the shells need it. Delicately fold in the nuts/sugar mixture in 2 or 3 additions. Slide your spatula all the way to the bottom of the bowl and comes back up several times to make sure no pockets of dry ingredients remain and the color is evenly blended. Prepare the baking sheet by lining them with parchment paper. Slide macaron templates under the parchment paper, if using. Transfer the macaron batter in a pastry bag fitted with a ½-inch [1.25-cm] round tip. Pipe 1½-inch [3.8-cm] rounds of batter, evenly spaced but still close to one another as they will not expand much. 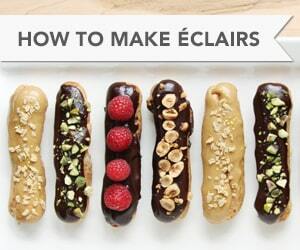 Carefully slide the macaron templates off the baking sheets, if you used them. Sparsely sprinkle dark cocoa powder over the shells (using a fine mesh strainer makes this easy). Let the shells rest on the baking sheets for 20 to 30 minutes. Preheat your oven to 275°F (135°C) with a rack set to the middle position. Bake the macarons for 13 to 16 minutes, rotating the pan after 10 minutes. Let the shells cool completely to room temperature before assembling them, about an hour. Pair same sized shells together and assemble with the milk chocolate and passion fruit ganache. 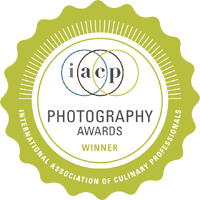 Store the assembled macarons in an airtight container and refrigerate for one night before indulging. Always bring the macarons back to room temperature before serving. 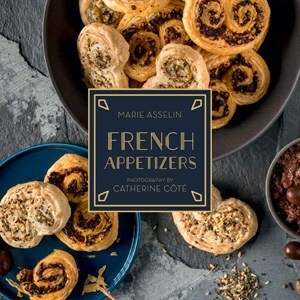 Recipe Credit: Marie Asselin. Flavors inspired by Pierre Hermé. Hi, are you using the covectuin oven?! This tempreture is for convection oven or the regular oven ?! Temperature is for a regular oven. It is not recommended to make macarons in a home convection oven as it tends to make the shells rise too quickly, resulting in either cracked or hollow shells. Marie these are gorgeous! One of my favourite Hermé flavours as well!